Biocat has opened the call for applications to the second edition of CRAASH Barcelona, a 12-week acceleration program that helps research teams from Catalonia and other European countries successfully launch innovation to market in the healthtech arena. The deadline for applications is 13 March and the program will begin in Barcelona on 8 May. The program is looking for projects with cutting-edge technology (diagnostics, devices or e-/digital health) from research centers, research institutes or universities in the BioRegion of Catalonia and from all over Europe. CRAASH Barcelona is open to research projects in the proof-of-concept or proof-of-feasibility phase. Established companies may also apply if they are looking for an application for their technology and/or searching for/validating a business model. The program is free of charge, equity free and offers teams up to €10,000 to cover travel expenses. CRAASH Barcelona selects and trains eight teams to commercialize their technology within 3 to 5 years. Participants will be guided by expert mentors from CIMIT (Boston), the most experienced healthcare accelerator in the world. Over 15 years, CIMIT has successfully accelerated more than 600 healthtech projects, doubled the commercialization rate and cut time to the next stage by more than half. 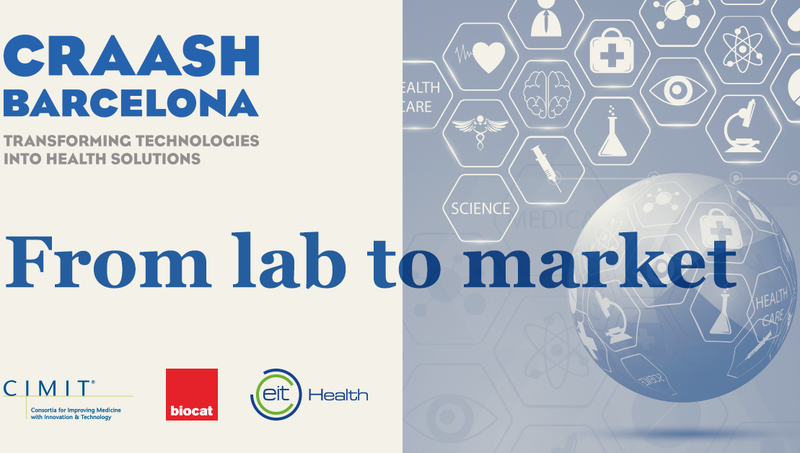 CRAASH Barcelona is organized by Biocat in collaboration with CIMIT and is part of the bootcamp program run by EIT Health, the main European healthcare consortium. Plus, this year CRAASH has a new partner: NUI Galway. Some of the teams participating in CRAASH Barcelona will get the chance to validate their project in some of the best health ecosystems in Europe (Paris and Delft). The best teams will also go to Boston, where in addition to validating their projects in the US ecosystem they will be able to do interviews and scout for collaborations with a personalized agenda. CRAASH Barcelona has been recognized by Diario Médico as one of the best ideas in healthcare of 2018. Eight projects took part in the first edition of CRAASH Barcelona, including ABLE, Biel Smartgaze and iBreve. The team at ABLE (Assistive Biorobotic Low-cost Exoskeleton), in collaboration with Institut Guttmann, is working to develop a light, low-cost robotic exoskeleton to help patients with spinal injuries walk again. For their part, Biel Smartgaze, a project to develop smart glasses using computer vision and virtual reality to improve visual perception for people with poor vision, making them more self-sufficient. Irish start-up iBreve is based on a portable device worn on the user’s bra that analyzes breathing patterns. The technology gives wearers immediate feedback to prevent stress from reaching dangerous levels. The deadline for applications to the second edition of CRAASH Barcelona is 13 March.